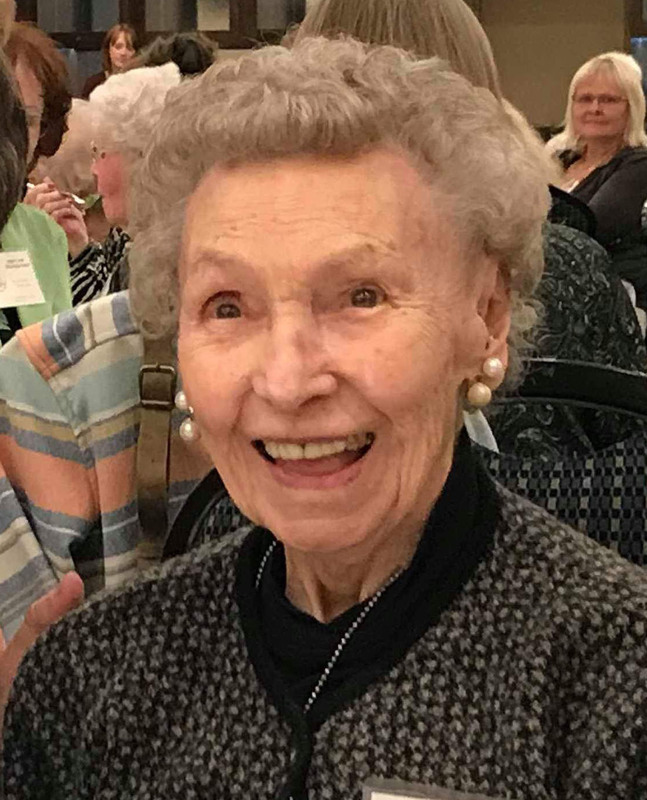 Elizabeth Gibson, age 105, passed away on February 10, 2019. Elizabeth was born August 4, 1913 in Choteau, Montana to Joseph and Anna (Hofsoos) Rodolph. Elizabeth’s extended family had roots in Rimini, MT, where she spent part of her childhood. She remembered making mud pies decorated with the white residue from the mine tailings, stating, “I guess it didn’t kill me.” Elizabeth also lived for many years in California, where she met and married Earl D. Tarvin. Elizabeth worked as an administrative secretary for Hughes Aircraft Company in the aerospace program, and Earl worked in the Hollywood film industry. Earl passed away in 1961, and a few years later Elizabeth and her aunt Christine returned to the family property in Rimini. She began work for the Montana Historical Society in the late 1960’s, retiring in October 1977. On August 20, 1980 she married Kenneth Walter Gibson at La Ronge, Saskatchewan during one of their float-plane fishing trips. Elizabeth and Ken enjoyed over 20 years of outdoor adventures, including fishing, hunting, and canoeing. In addition to Rimini, they lived in Dubois, WY for a few years, in search of more open winters. The Wyoming wind blew them right back to Montana. Their initial return to Helena prompted a short stay in an old miner’s cabin on the Austin mining claim in the mountains west of Helena. This was a rather wintry spring in Montana, turning their stay into one more adventure. After Ken’s passing in 2005, Elizabeth lived in Hunter’s Pointe retirement community for many years, enjoying friends, serving on the welcoming committee, keeping the library organized, and many other activities. She spent her last three years at Touchmark, where she was embraced by the helping hands and loving hearts of the assisted living staff, whom she dearly loved. Elizabeth will be remembered for her quick wit and humorous one-liners. Elizabeth was a 55-year member of the Ocean Park Chapter of the Order of the Eastern Star (Santa Monica). Elizabeth is survived by her three stepdaughters, Lori (Dan) Moore of Helena, Celia (Mike) Styren of Bozeman, and Priscilla Gibson of Eugene, Oregon, as well as her cousins Kathryn Smith of Helena, and Tom Hafsoos of Milwaukee, WI. Elizabeth’s family wishes to express our deep appreciation to the entire Touchmark staff for the compassionate care provided to Elizabeth. We are additionally thankful for the tender care given by her home health care nurses, and by St. Peter’s Hospice. We are grateful for the kindness shown to Elizabeth and to us by Touchmark residents and staff alike. A Memorial Service will be held at 2:00 p.m., Friday, February 22nd at Touchmark, 915 Saddle Dr. Please join the family following the service for a coffee and cookie reception at Touchmark. Memorials are suggested to St Peter’s Hospice, 2475 Broadway, Helena, MT 59601. Please visit below to offer a condolence to the family or to share a memory of Elizabeth. It was such an honor to care for her. Her sense of humor was like no other. I will forever miss our conversations, our time at the dinner table, and aeeing her in the hallway. She will forever hold a special place in my heart. Elizabeth was such a lady, we are grateful we had the chance to get to know her. Lori and Dan, I like the photo you put with Elizabeth’s obituary. It is my mind’s picture of Elizabeth, that is her. She was a beautiful, gracious lady. It was a pleasure to know her. I started cleaning elizabeths apartment at touchmark a little over a year ago. She had asked me to go to lunch with her. But i wasnt able to that day but, the next day we went down to the Bistro and had the best time laughing and joking. She remembered thing from when she was 30 and shared with me. All her storys of travling and her family. She would sit in a chair on frist floor Assisted living by the laundry Room. And i alway made a piont to visit with her. She was like one of my grandparents. Always asking if i was causing trouble. Because next to hersey chocolate, and hug. Trouble was the next best thing. I will miss her. She touched my heart in so many ways. And taught me so many thing. She was the blessing i have needed for some time. Ohh what an amazing lady she was, the smile to the hair being done just perfect. The love she had to share with all of us, and the care she gave was out of this world. Sure will miss getting to talk to her on the phone Sunday mornings. Oh, what a beautiful lady, both inside and out. Elizabeth and my Mom were best friends. They lived up on Main Street and they would share the fun times they had. She was very precious to me. Returning to Helena will not be the same without our visits. It was always a special treat to see Elizabeth’s name on the schedule at our dental office. She was always so peppy and positive and had the most beautiful smile and sincere heart. She was just a delight to be around. I’m sure she will be greatly missed by all who knew and loved her. A real class act !! Beautiful inside and out !! I’ll dearly miss Elizabeth. She was a very happy, positive, and kind person I was lucky to ever meet ❤️ I’ll always remember her wild stories, her witty comments, her hugs and kisses. Oh, also her “Moo” “Moo” “Say Moo” as we passed those decorations cows in ASL hallways. She will always hold a special place in my heart.